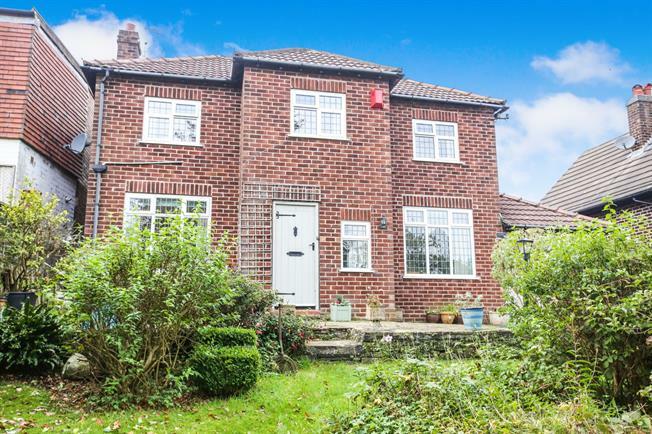 4 Bedroom Detached House For Sale in Macclesfield for Guide Price £475,000. Hardwood front door. Double aspect double glazed uPVC windows facing the front and side. Radiator, parquet flooring, under stair storage. UPVC patio double glazed door to rear. Double glazed uPVC window facing the front. Radiator and gas fire. UPVC patio double glazed door leading to garden. Double glazed uPVC window facing the rear. Solid oak flooring, under stair pantry storage, tiled splashbacks. Granite work surface, fitted wall and base units, granite topped island, belfast style sink with mixer tap, range oven, over hob extractor, space for dishwasher. Double glazed uPVC window facing the rear. Tiled flooring. Wood work surface, fitted wall and base units, single sink, space for washing machine. Double glazed uPVC window facing the side. Tiled flooring, boiler. Low level WC, wall-mounted sink. Wooden garage doors. Double glazed uPVC window facing the side. Double bedroom; double glazed uPVC windows facing the rear. Double glazed uPVC window facing the side. Heated towel rail, tiled flooring, tiled walls. Low level WC, single enclosure shower, wash hand basin. Double bedroom; double aspect double glazed uPVC windows facing the front and rear. Radiator. Double bedroom; double glazed uPVC window facing the front. Radiator. Radiator, vinyl flooring. Low level WC, roll top bath, single enclosure shower, wash hand basin.